Pet. I sweare Ile cuffe you, if you strike againe. And if no Gentleman, why then no armes. Pet. A Herald Kate? Oh put me in thy bookes. Kat. What is your Crest, a Coxcombe? Pet. A comblesse Cocke, so Kate will be my Hen. I had fun with puns. Drove Tilney up the wall, but Bess loved them. The randier the better. The excerpt above, from The Taming of the Shrew in the First Folio, was already at the top of this page when I heard some heraldic ‘news’ a couple of days ago. 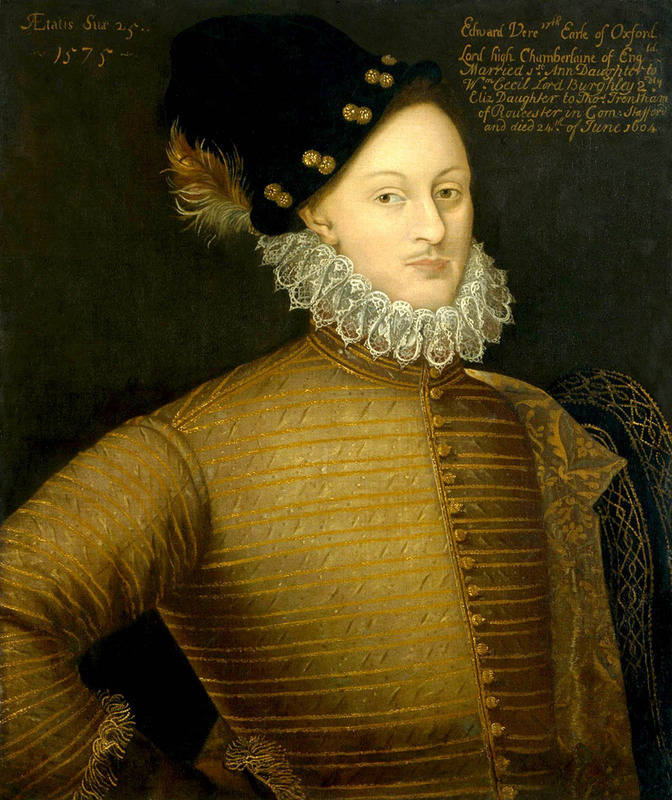 If you’re not aware of the latest hallucination from Warwickshire by way of a Folger Library curator (quelle surprise) and The New York Times, then please read these articles by the DeVere Society and the Shakespeare Oxford Fellowship, which explain and refute more cogently than I can. The Times story is vested-interest Stratfordian mendacity, misdirection, and mistakes, as usual. Wishful thinking. It’s not even new. Here are the books I was writing about when I was interrupted by dubious bookes of armes. I’ve been spending time recently with a pair of old friends. I thought I’d share a few photos, and some biographical bibliography. Written by two of my earliest partisans: Tom (J Thomas Looney) and the Captain, Bernard M Ward. Tom wore Oxfordian Badge #001, for all modern intents and purposes. 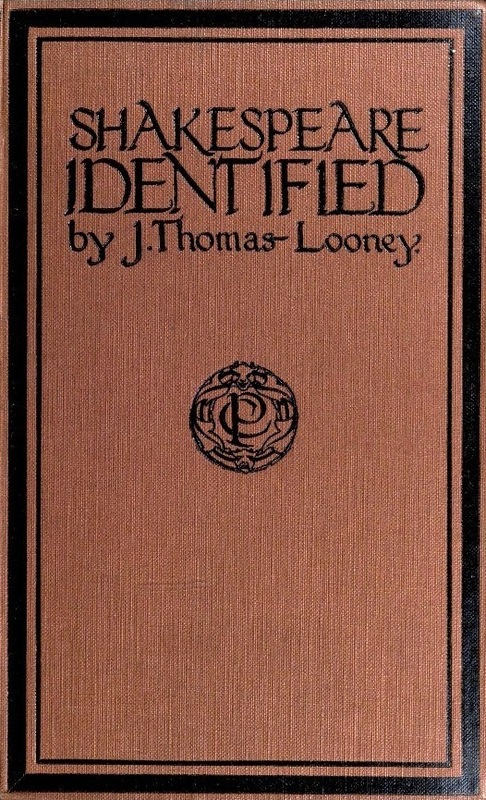 His book was published in 1920, followed by Ward’s in 1928. These pictured are both first editions, though the Looney is from the American publisher and has been rebound. The Ward still has its original pink cloth cover, with a badly faded spine. Years spent on a sunlit bookshelf, I’d guess. I was just shy of 25 years old when I sat for that portrait. Looney’s printed reproduction is taken from a 17th-century copy, now known as the Welbeck portrait. It has become my default image. Digression: There’s a painting called the St Albans portrait, of an older, dark-haired gentleman in a white doublet with a boar pendant, which is often identified as me. It’s understandable because like the Welbeck, it has a superscribed caption with my name and numbered title painted on it. But unlike the Welbeck, this one is a case of ex post facto misidentification. Someone added the caption later (perhaps much later), and was off by a generation. Take my word for it, the St Albans portrait is of my father John, the 16th Earl. Even well-meaning partisans trip on this. Ogburn junior tripped twice. The Welbeck’s original, for which I sat in early 1575 at the beginning of my 15-month stay on the Continent, is lost, gone, but the copyist didn’t do a bad job. 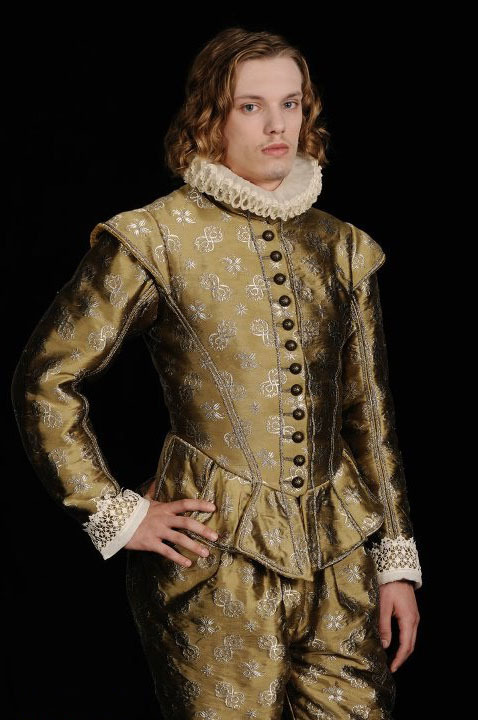 If you want to see me as I looked in my salad days – not quite like Jamie Campbell Bower in the movie, but squint a little and it works – here you go. from the Portrait at Welbeck Abbey. His Grace the Duke of Portland. Since 1964 it has been on loan to the National Portrait Gallery. Many of the pages in this 96-year-old book are loose, taped, or in dire need of tape. Imagine what the old cover looked like before it was rebound. Here is what the original American cover looks like, and the British cover. The handwriting on the title page reads Arthur R. Tunsun, New York – Mar – 1923. He’d have a low badge number as well. The copyright page and some of the preface. In pencil at upper left, the Dewey Decimal number. More about that below. Another reproduction of the Welbeck portrait, opposite Ward’s title page. Ward’s unfaded front cover. The actual size of the stamped design is roughly 6 cm x 5 cm. Note that the molet (star) in the escutcheon is stamped from silver leaf, while the rest of the achievement is in gold. Two separate stampings. If you’re into book publication (I’m talking to you, Cow Eye Press), this represents an increase in the cost and time needed to make the cover, solely for accuracy in a detail that few would notice. But I noticed. Worth every penny. Note also how the shield is somewhat worn, and there are ink smears. Not bad for eighty-eight years old, but still. There’s also perspective distortion in my photo, you can tell by the the slanting vertical lines in the cloth. It’s hard to shoot from directly overhead without casting shadows, unless you have a camera stand and special lighting. I don’t. Here’s what I did with that photo during the breaks I took from reading about myself. I already know the ending. The bird-like creature with the head of a maiden is a harpy. Ever see this scene from Jason and the Argonauts? Harpies. If you’re an Oxfordian who would like to save that image for use elsewhere, please be my guest. All I ask is that you don’t erase my website and Twitter addresses from under the motto. Fair’s fair, I did the work with my own armes. Make your own joke about me asking for credit for something I’ve done. “Shakespeare” Identified is in the public domain. 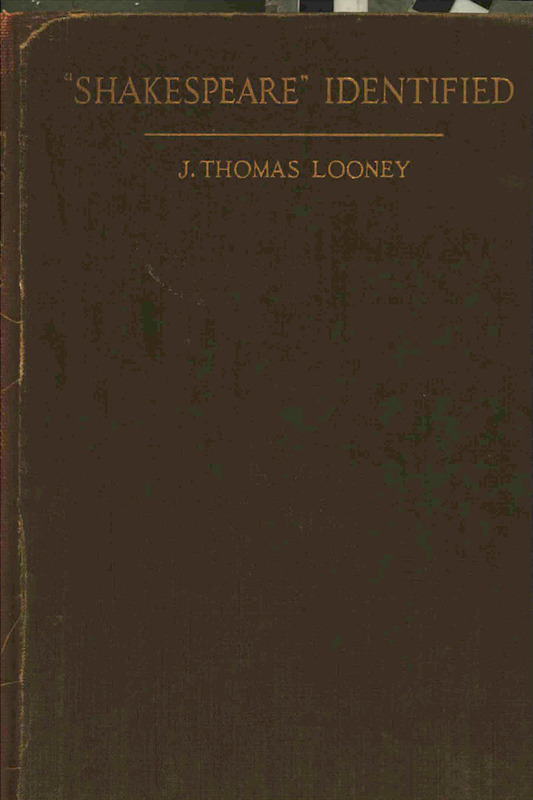 It is available at the Internet Archive in on-screen and downloadable formats, including both the London and New York first editions. If you’d rather use ears than eyes, there are audio files which you can download or stream right from the web page. The internet is a gift. A Centenary Edition of “Shakespeare” Identified has recently been published, in time for the book’s 100th birthday in 2020. I’ve updated the information on my Library page, so please take a look there if you’re interested in a paper copy. Ward’s biography is more problematic due to its copyright status, which is hard to determine definitively since different countries have different rules. Postlife is too short for some tasks. But the original London publisher appears to have issued a facsimile reprint in 1979, which would indicate that it is still in copyright in both the UK and the US. That would explain the absence of a free digital version. On the other hand, one source I found said that the reprint was unauthorised, so who really knows: not I. You can’t imagine what investigating copyrights would do to my blood pressure, if I had any. Blood pressure. Or copyrights. I found a limited text search at hathitrust.org, which returns the page numbers and totals for text matches, but without letting you see the actual text. So very helpful. Used copies, even of the reprint, do not flood the resale market. If you managed to track one down you’d probably have to sell a couple of manors to pay for it. Six months after I wrote this post, Ward’s biography was uploaded to the Internet Archive. I only discovered it a further year later, because it’s listed with the title “The Seventeenth Earl of Exford”. Carelessness? Camouflage? Contempt? Who knows. It’s a weird scan with pages trimmed to differing sizes, but it might be your best chance to see what’s in the book. I suggest you download the PDF, as the browser reader doesn’t display the oddball pages very well. I also found some contemporaneous reviews. These two tear Ward into tatters. Not unexpected, and some of the criticism is warranted. You’ll need a JSTOR login (or too much cash) to view the first one, but the second can be read online if you register. Don’t despair though, there’s a much nicer review at unz.org, and this one is free to view and download. Public Service Announcement, especially for Americans: If you’ve never heard of Ron Unz (he’s from California), go to Wikipedia after you’re done here, read his entry, then take care not to confuse unz.org with unz.com. You’ll know if you land on the wrong one. Fact: I am the only author in history with his very own Dewey Decimal classification number. You guessed it: 822.33. Yes, the entry is mislabelled under the name of William Shakespeare, but never mind that. There’s her number, and it’s specific to me as opposed to those other misbegotten alternatives, so now I want that number on my plate instead of the Dewey number. Even 822.33A isn’t as good as PR2947.O9. Though I still don’t have a car. Ward’s book, on the other hand, doesn’t have anything at all to do with Shakespeare in the eyes of standard-issue librarians, because it’s just a biography of the seventeenth Earl of Oxford (I need a drink). In fact, while writing the book, Ward was expressly prohibited by his publisher from making any connection between the Earl and the Author within the main text. He was only permitted to describe my literary and dramatic activities in interstitial sections called Quarantines Interludes. Even in these, no connecting-the-dots was allowed. Can you imagine, trying to write my life with those restrictions. If only the Captain had had a blog. Both of these books are important in the history of the authorship question in the 20th century. But while Looney is readily available (the Centenary paper edition mentioned above, or as an ebook), and interesting, and still relevant, I’d only suggest reading Ward if you were familiar with my life from other sources. I can’t recommend it as a go-to reference. It’s too close to hagiography, and I say that as the hagiographee. There’s a better alternative. Mark Anderson has written my life in a fine biography, which compared to Ward’s is hot off the press. 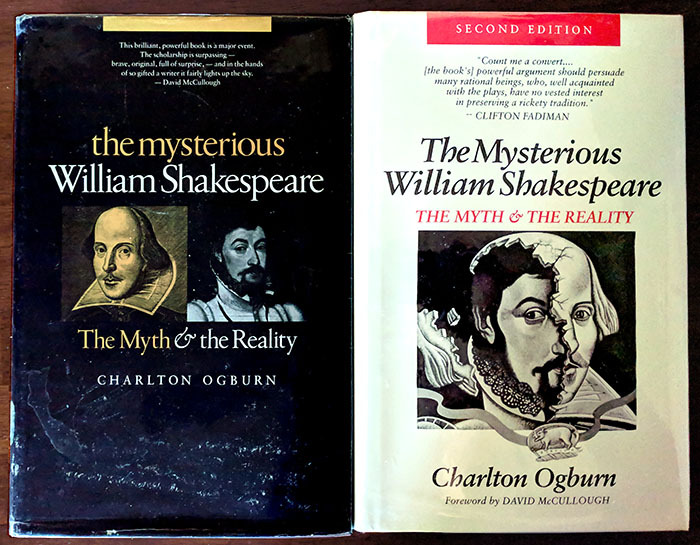 The hardback edition of “Shakespeare” By Another Name was published in 2005, the paperback in 2006, and the ebook (including some updating) came out in 2011. There’s also an audiobook, although note that it’s an abridgement. Even if I wasn’t the subject, I’d encourage you to read it. Head to Mr Anderson’s website, and there you’ll find all the details you need to order a copy in whatever format you prefer. Enjoy thy bookes. And don’t believe everything you read in The New York Times. 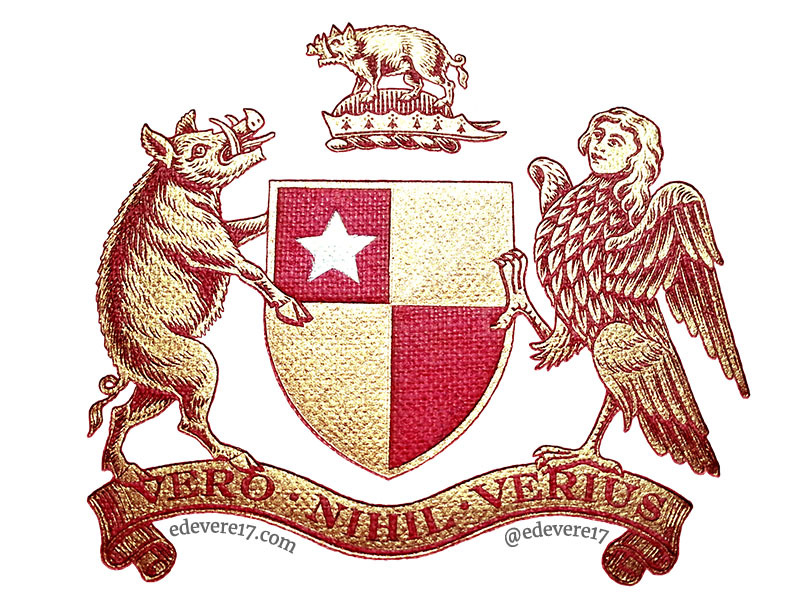 Posted on 5 July 2016 31 March 2019 by @edevere17Posted in Authorship (of Shakespeare), Books, History, Literature/Writing, Other Writers (since 1900), Shakespeare, The Taming of the Shrew, Updated PostsTagged "Shakespeare" Identified, Bernard M Ward, Biography, DeVere Society, Edmund Tilney/Master of the Revels, European Union, First Folio of 1623, Heraldry, J Thomas Looney, Library Science, Mark Anderson, Shakespeare Oxford Fellowship, St Albans Portrait (mislabelled), Stratfordians, Welbeck/Paris Portrait, William Shakspere of Stratford-upon-Avon.